Atrial fibrillation (AF) is a common heart rhythm disorder that leads to one-sixth of all strokes. Prevention of strokes in AF is achieved through the use of blood thinners such as Coumadin. Although these blood thinners are effective, they are limited by the risk of serious bleeding, by physician and patient reluctance to use, and by noncompliance and discontinuation. The left atrial appendage is a structure on the upper chamber of the heart that is the most common source of stroke in patients with AF. This structure is easily accessible during open heart surgery for removal, and has been an area of interest for stroke prevention. However, there is currently no definitive evidence that removing the left atrial appendage works to prevent stroke. The LAAOS III trial is randomly (like the flip of a coin) assigning patients with AF undergoing heart surgery for other reasons to have the left atrial appendage removed or not. These patients, other than this small procedure which has been shown to be quite safe, will be treated in the usual manner. The trial is expected to enroll 4700 patients in 100-120 centers globally and will follow these patients for an average of 4 years after surgery. 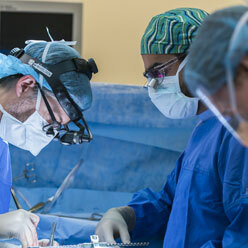 Our objective is to determine if removing the left atrial appendage can reduce stroke and other complications on top of usual therapy for stroke prevention. A positive study will change the way heart surgery is performed on AF patients and will result in a large reduction in the number of strokes in a large population. Furthermore, it will promote further research into this approach that could be applied beyond AF patients undergoing.